When it comes to “light” snacking, popcorn is always one of my favorites. There’s something about the wonderful airiness of popcorn that is such an amazing vehicle for both flavor and for satisfying snack cravings without weighing you down or leaving you feeling like you have to go run laps to make up for your indulgence. G.H. 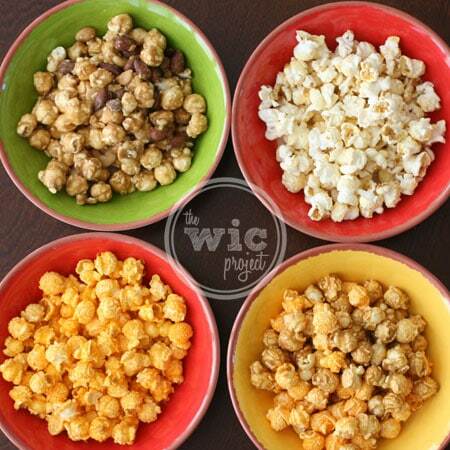 Cretors Popped Corn offers five amazing varieties of popped corn that are all natural and delicious. When I served G.H. Cretors at a recent get-together, each flavor was gobbled up in a matter of minutes. All of the flavors were distinct and unique – whether it was enjoyed by itself or mixed with another flavor, like the Chicago Mix which has both cheddar and caramel popcorn. What can I say about the G.H. Cretors Popped Kettle Corn other than it’s deliciousness in a bag. It is one of those snacks that once you start eating, you’ll keep popping in the perfectly flavored popped corn kernels that have been lightly dusted with sugar and salt. A word of warning – you may need to moderate yourself to ensure you don’t finish the whole bag in one sitting. It’s that good. The G.H. Cretors Just the Cheese Corn tasted exactly how it should – like popcorn covered with cheddar cheese. You can tell that they make this from real cheddar cheese as each bite has that hint of sharpness that can only come from cheddar. I loved how it didn’t taste artificial or too salty. If you favor sweeter popcorn, then the G.H. Cretors Just the Caramel Corn is right up your alley. Each popped corn is generously coated with a butter caramel that is both smooth and sweet. You can enjoy the caramel corn by itself or for some extra crunch, try the Caramel Nut Crunch which mixes the caramel corn with freshly roasted almonds and cashews which area also coated in the butter caramel. The most impressive thing for me was how each bag of popcorn was full of flavor and still tasted as if it had just been freshly popped. The popped corn was crispy and there wasn’t a burnt kernel in sight. Also, all of G.H. 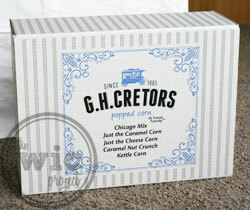 Cretors popped corn is all natural and kosher. There is not gluten and no GMOs, so you can be confident in what you’re snacking on. If you love popped corn, make sure you enter the G.H. Cretors Freebie Fridays Summertime Sweepstakes. Through September 21st, one winner will be selected every Friday to win a popped corn variety pack. Enter as many times as you want for your chance to win! G.H. Cretors has just launched a fun new contest on their Facebook page. Take a look at that popcorn. Do you see a bird, a cat, or something else looking back at you? Snap a picture and submit it to the G.H. Cretors Popped Corn Look-A-Like contest. 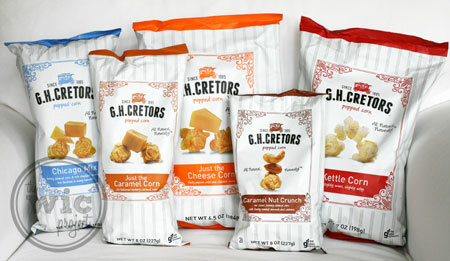 Every Monday, one winner will be selected to win a GH Cretors variety prize pack! G.H. Cretors uses all natural/ non-genetically modified ingredients, no artificial colors or flavors, and no gluten ingredients to bring you the best tasting popcorn you’ve ever had! One winner will receive a G.H. Cretors Popped Corn Variety pack! I want to try the Caramel Corn most. Sounds yummy. caramel nut crunch sounds good. I want to try the Chicago Mix! I think I’d like to try the Chicago Mix most! Thanks. Just rhe Cheese Corn !!!! Caramel corn of course, yummo~! The caramel nut for sure! Which G.H. 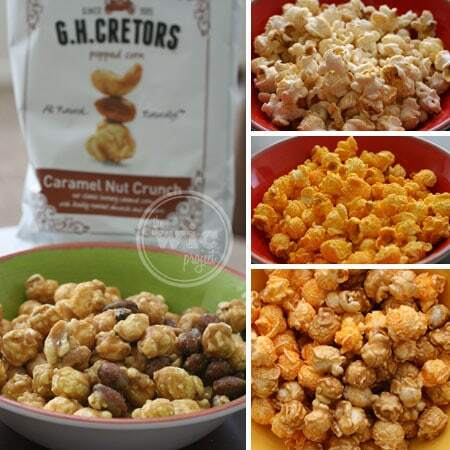 Cretors Popped Corn flavor do you want to try the most? Carmel corn, love me some popcorn! I would like to try their Just the Caramel Corn! I love cheese popcorn, so I would choose cheese. Carmel Nut Corn sounds good. I LOVE cheese corn! Thanks! I would like to try the Caramel Nut Crunch. Not fussy – would love to try them all! I want the Just The Cheese please! 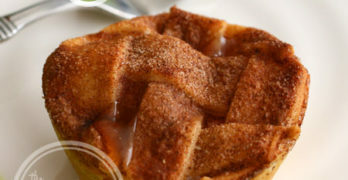 This stuff looks SOOO good! My daughter knows I’m a popcorn-holic and got me the humongous bag from Costco…Chicago Mix…OMG just thinking about it, makes my mouth salivate… the combo of buttery sweet caramel and cheezy does a job to my taste buds! I know I’d love the Cheddar Cheese but I’ve got a sweet tooth right now so I’ll say the Caramel corn…LOL! I would love to try the Chicago Mix. I’d like to try the Chicago Mix. I want to try caramel nut crunch! I’m a Chicago girl so I most want to try the Chicago Mix and compare it with Garrett’s! I”d love to try the cheese corn. Yummy! I want to try the Caramel Nut Crunch. i want to scarf the Caramel Corn! I WANT TO TRY THE CHICAGO MIX. Cheese Corn. That served with cold beer. The chicago mix sounds awesome! The Caramel Corn sounds YUMMY! I have not found a pop corn I didn’t like yet, GOD BLESS AND KEEP YA’LL SAFE IN HIS LOVING ARMS. I would like G.H. Cretors’ Carmel Nut Crunch because I love carmel and nuts. Kettle corn. I LOVE kettle corn!!! I’d like to try Caramel Nut Crunch. I’d love to try the Chicago Mix flavor combo. Being from Chicago, the Chicago Mix looks enticing to me. However, since I love popcorn, I’d be happy to try any of the flavors. Just the caramel corn. I have tried the cheese/caramel combo and it’s yummy. carmel nut crunch sounds like a mouthful of heaven!! I would like the chicago mix…….. looks really yummy!!!! I love to try Just the Cheese corn! The Caramel corn is my flavor. Love to try the Chicago Mix. Thanks for the giveaway. I would like to try Just The Cheese Corn. It is between the Chicago Mix and the Caramel Nut Crunch. I’d love to try the Caramel Nut Crunch. Caramel nut crunch sounds best. I would love to try the kettlecorn. Cheese Corn sounds the best! I would want to try the Chicago Mix the most. for me the carmel nut crunch sounds great!!! I would love to try the Caramel Nut Crunch! I would like the kettle Corn. Kettle corn is much better than regular popcorn. The cheese corn would be awesome! Chicago mix sounds so good! wow, each and every flavor of this looks amazing! the caramel nut crunch is the one i want to try first! I would love to try the Just the Cheese Corn. I would love to try the Caramel Nut Crunch. I want to try Just The Cheese Corn.